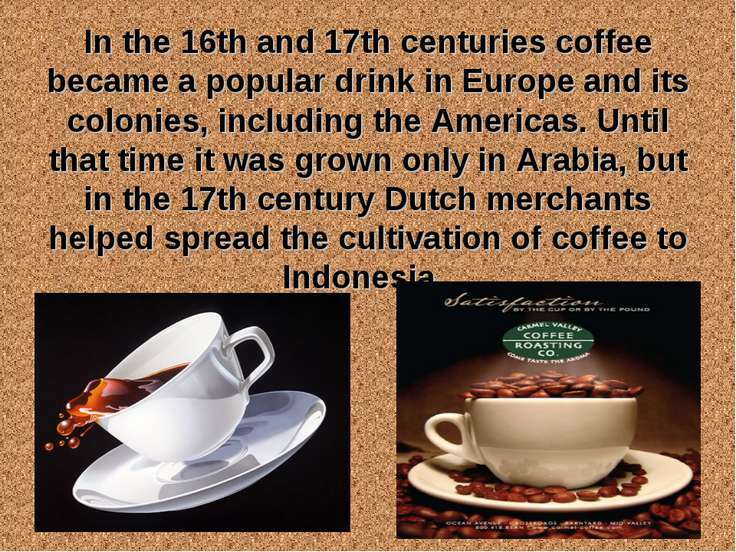 Good flavor and aroma, combined with the stimulant caffeine, have helped to make coffee one of the most popular drinks in the world. Coffee is prepared by brewing the roasted and ground beans of a coffee tree in water. 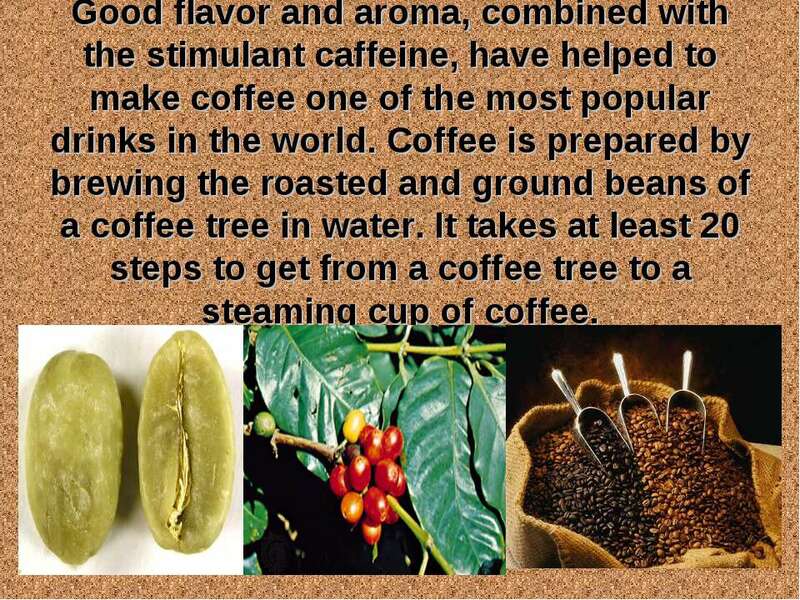 It takes at least 20 steps to get from a coffee tree to a steaming cup of coffee. 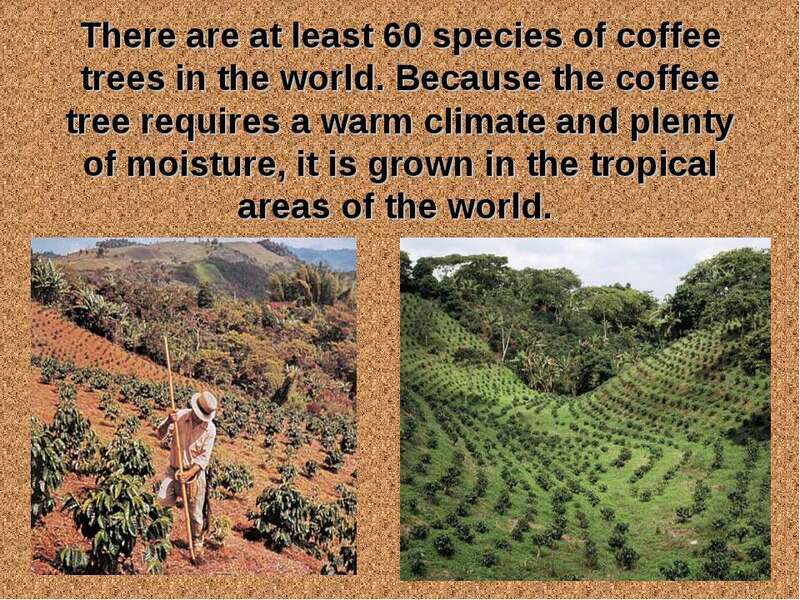 There are at least 60 species of coffee trees in the world. Because the coffee tree requires a warm climate and plenty of moisture, it is grown in the tropical areas of the world. Since the mid-1800s, Brazil has been the foremost coffee-growing nation. 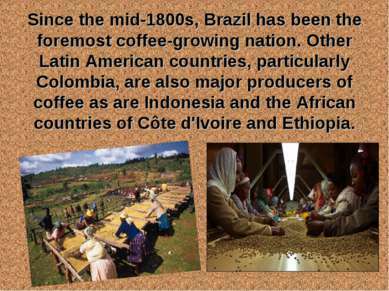 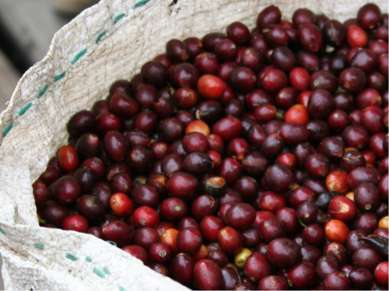 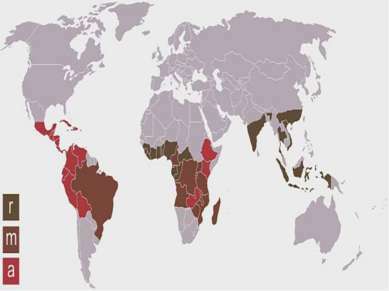 Other Latin American countries, particularly Colombia, are also major producers of coffee as are Indonesia and the African countries of Côte d'Ivoire and Ethiopia. 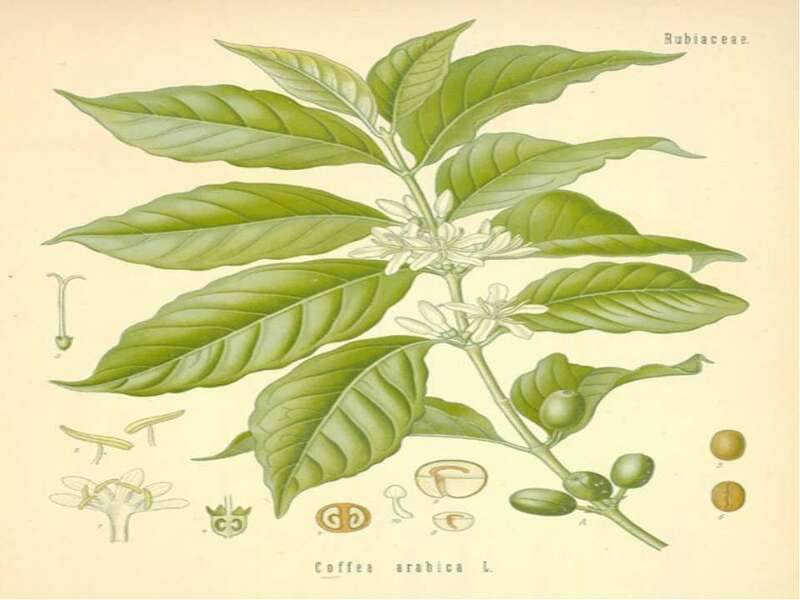 Two varieties of the coffee tree—Arabica and Robusta—account for almost all of the world's production of coffee. 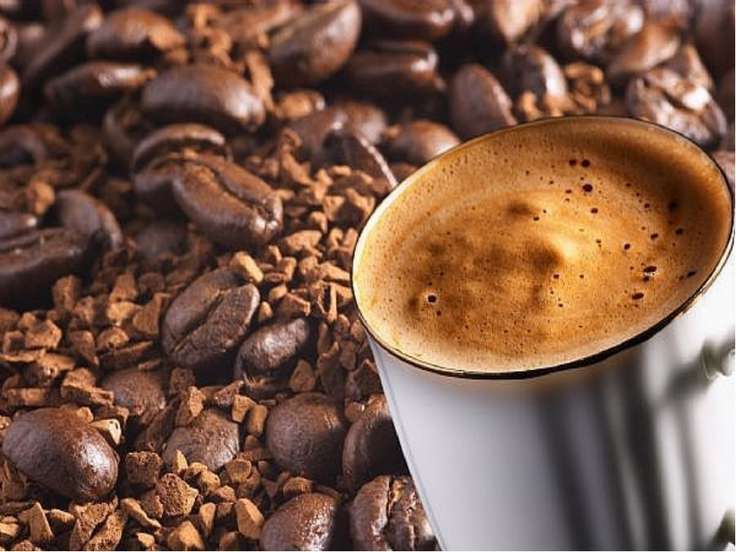 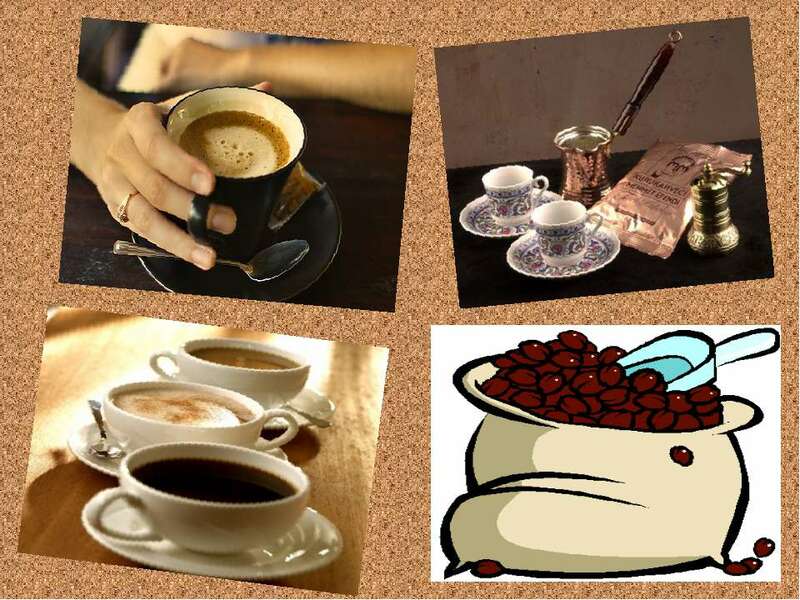 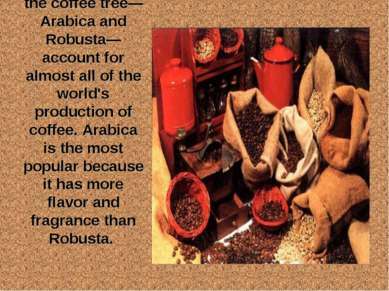 Arabica is the most popular because it has more flavor and fragrance than Robusta. 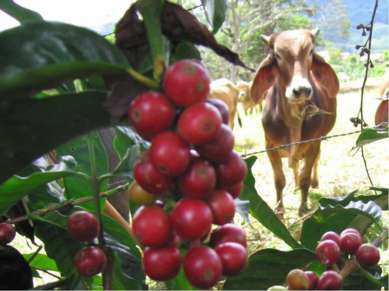 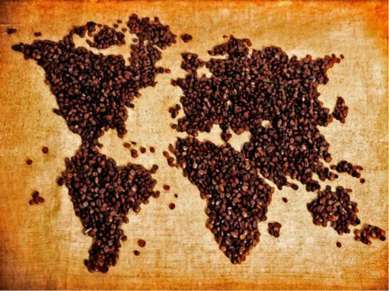 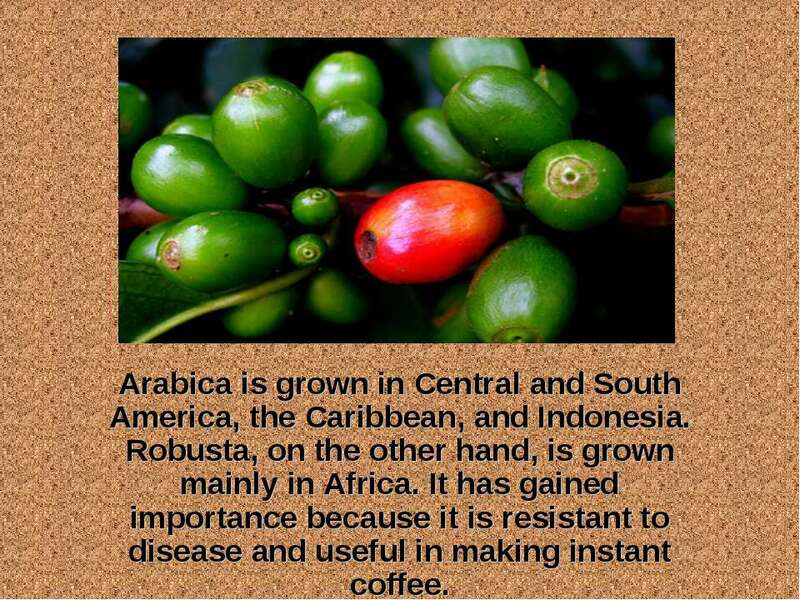 Arabica is grown in Central and South America, the Caribbean, and Indonesia. Robusta, on the other hand, is grown mainly in Africa. It has gained importance because it is resistant to disease and useful in making instant coffee. An ordinary cup of coffee contains about 150 milligrams of caffeine, a chemical substance found naturally in coffee beans. 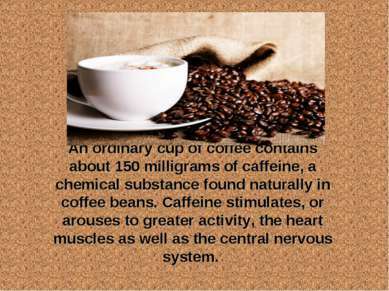 Caffeine stimulates, or arouses to greater activity, the heart muscles as well as the central nervous system. For some people, drinking a cup of coffee in the evening makes it difficult for them to fall asleep. Although there are side effects associated with drinking coffee, coffee is not considered harmful to the average adult. 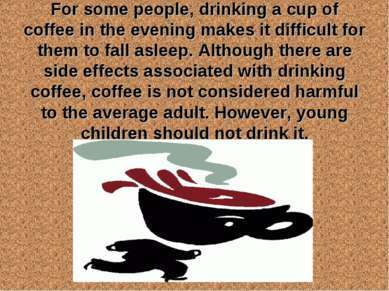 However, young children should not drink it. 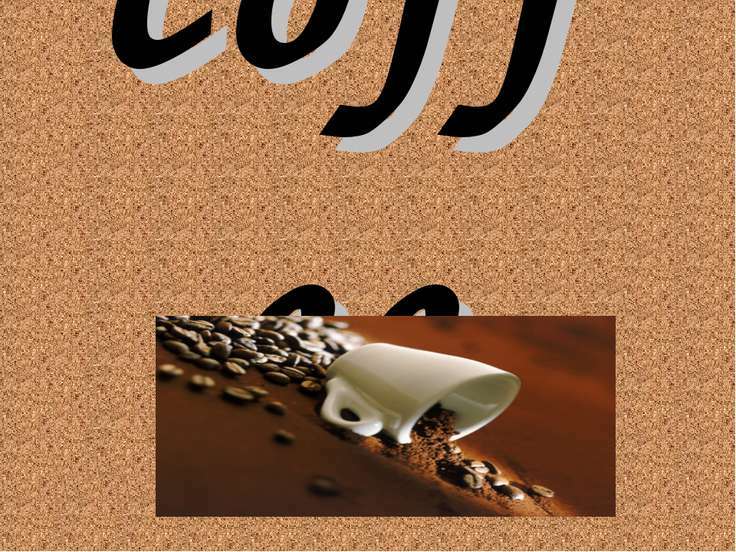 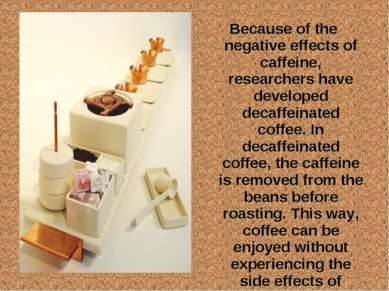 Because of the negative effects of caffeine, researchers have developed decaffeinated coffee. 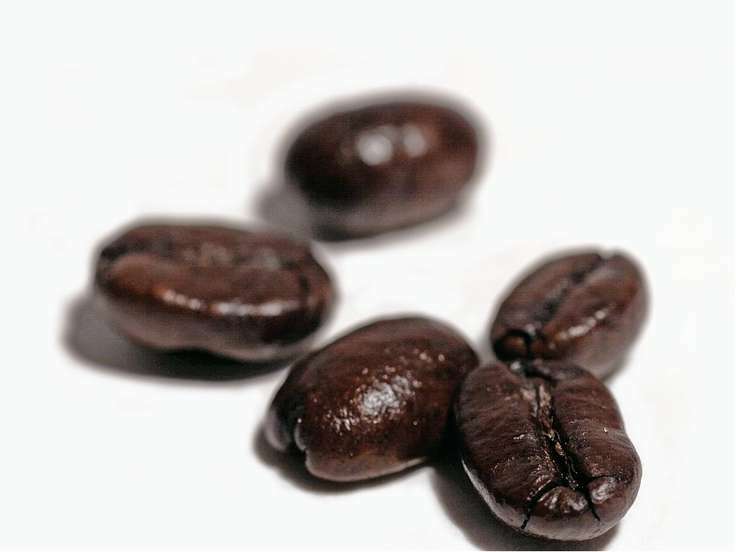 In decaffeinated coffee, the caffeine is removed from the beans before roasting. This way, coffee can be enjoyed without experiencing the side effects of caffeine. 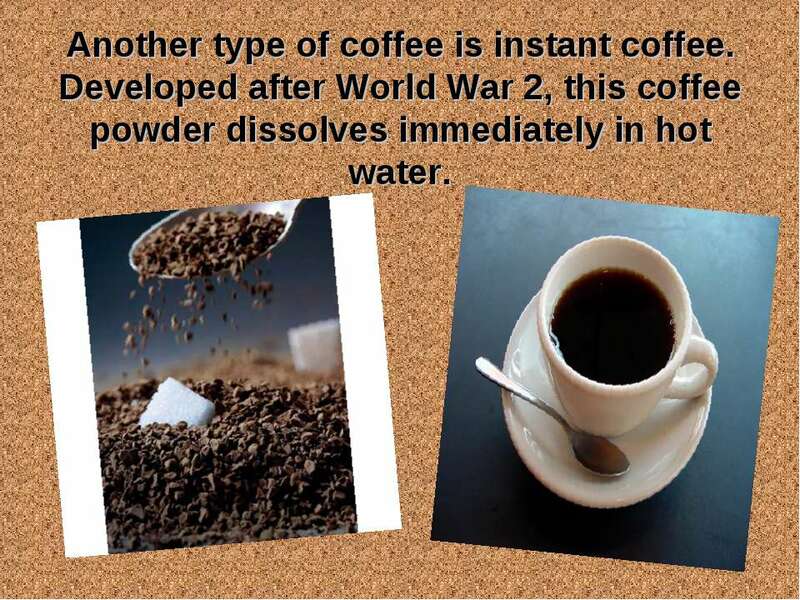 Another type of coffee is instant coffee. 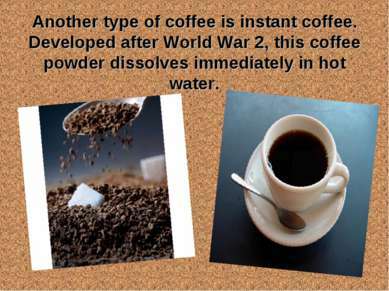 Developed after World War 2, this coffee powder dissolves immediately in hot water. 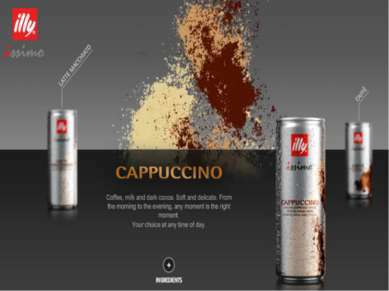 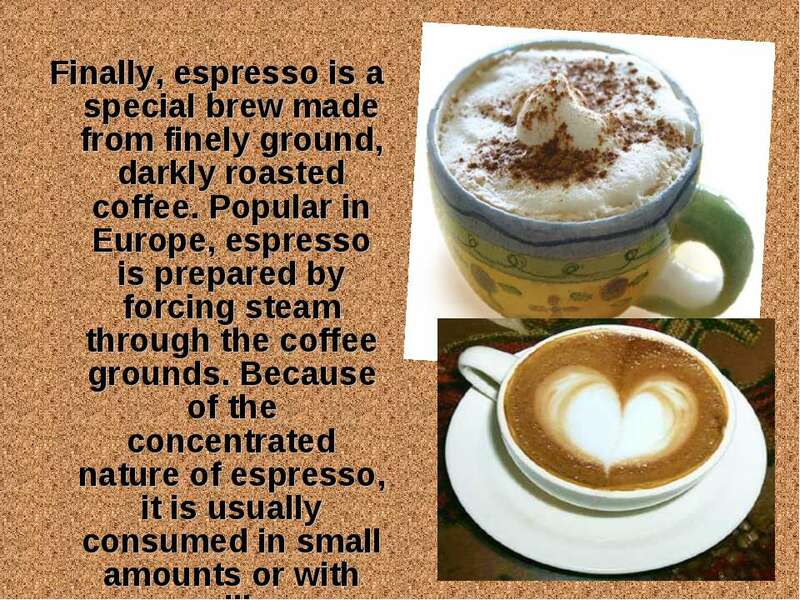 Finally, espresso is a special brew made from finely ground, darkly roasted coffee. 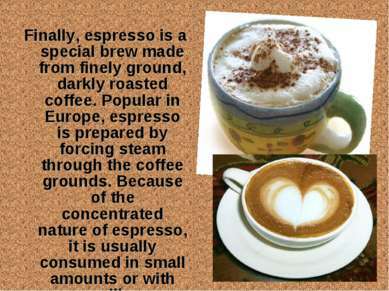 Popular in Europe, espresso is prepared by forcing steam through the coffee grounds. 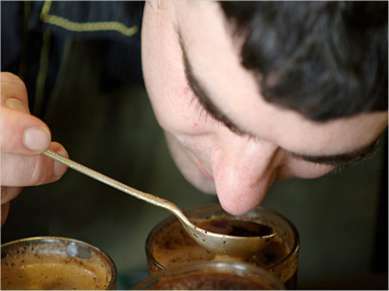 Because of the concentrated nature of espresso, it is usually consumed in small amounts or with milk. Coffee is believed to have originated in Ethiopia, in Africa, in about the 6th century AD. 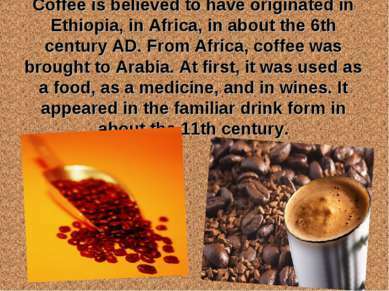 From Africa, coffee was brought to Arabia. At first, it was used as a food, as a medicine, and in wines. It appeared in the familiar drink form in about the 11th century. 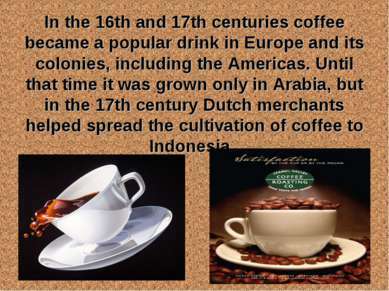 In the 16th and 17th centuries coffee became a popular drink in Europe and its colonies, including the Americas. Until that time it was grown only in Arabia, but in the 17th century Dutch merchants helped spread the cultivation of coffee to Indonesia. 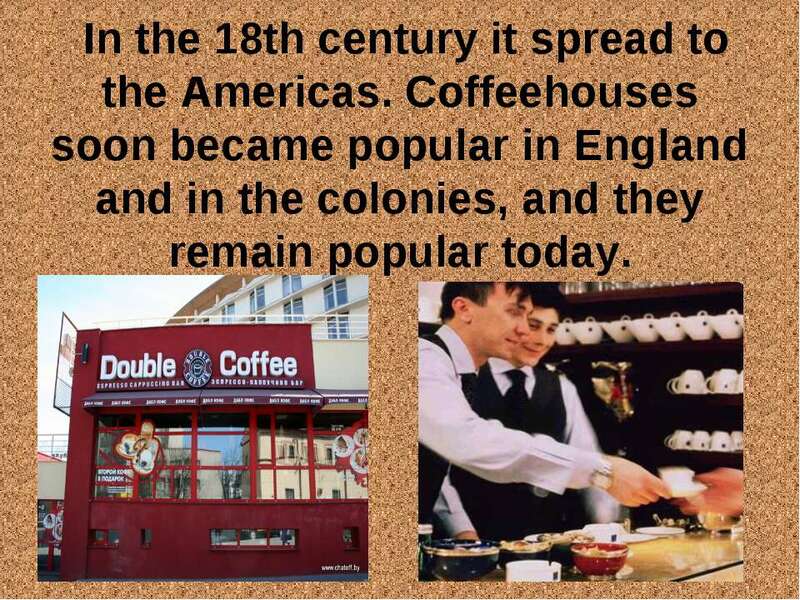 In the 18th century it spread to the Americas. Coffeehouses soon became popular in England and in the colonies, and they remain popular today.